If the above all seem the same don't worry - presently, the distinctions between #1, #2, and #3 will become clear and you will get a better sense of when you might want to choose one method over another. Note: Although I'm illustrating how to update symbology, you can apply the same concepts to update/configure other properties such as pop-ups, labels, etc. I encourage you to build upon the below standalone scripts or use only the parts you need! But one day you decide that you don't really like the color orange and would get more use out of the Web Map if you could better visualize total population of each county. After some time, you settle on the symbology included in the attached webmaplyr.json. It's a bit a long so I won't include it here - this is fine because you probably won't want to define the JSON in your script anyway, preferring to read from a file. Share (temporarily) the item to 'Everyone' if you don't want to have to supply a token. The difference here is subtle. In Option #1, the item being updated is a Web Map. Here, the item being updated is a Feature/Map Image Service Layer. The service might be something you published to ArcGIS Online/Portal for ArcGIS, or a Map/Feature Service you added as an item to your content. Option #1 is great if all you need to do is change the styles in a Web Map, but perhaps you need to change the style for an item in your Organization. Since this item is used by many people (and deliverables are occasionally provided to stakeholders outside of the organization) you wish to standardize its appearance. In this example, I use the same Map Service as before (https://sampleserver6.arcgisonline.com/arcgis/rest/services/USA/MapServer) and perform a similar update to the symbology, only on the Layer item itself. Here you see that only the layer at index 3 is updated (counties) - everything else in the service is left alone. Review drawingInfo.json and you can see that the renderer is updated from Single symbol to Classified. A layer definition isn't necessarily created by default. Let's suppose I only just added that Map Service as an item to my content - that ArcGIS Online/Portal for ArcGIS item has no layer definition attached it. If added the item to a Web Map, made a simple symbology change, and saved the layer this would generate an layer definition. complete.json contains the layer definitions that would apply to the entire item (all 4 layers). So, what's the difference here and when would you want to use this approach? This will only work for Feature Services. You would want to use this approach when you want to make high-level updates to your Feature Service Layers. This can be used to standardize the appearance of Feature Service Layers across the board - without making any client-side modifications, someone adding the Feature Service to a ArcGIS Online/Portal for ArcGIS Web Map would see the same thing as a developer consuming the service in an application. In this scenario, since we're updating a Feature Service and not an item we need to use arcgis.features. The States/Provinces layer was at index 1. That concludes this overview on how to update layer symbology. Hopefully with this guide you can get a good sense of how to implement similar workflows in your organization! Our Storm Water personnel maintain several feature classes in an enterprise geodatabase, which is currently at version 10.6. Each of these feature classes is related to two tables: one for inspections and one for events. Each feature class has a field which represents the number of days since the feature was visited, either by inspection or event. They symbolize their layers by this field, using graduated colors, to show how long it's been since the feature was visited. For example, red features haven't been visited in a long time while green ones have been visited recently. Storm Water wanted this field updated automatically every night. # Requires ArcGIS Desktop Standard or Advanced. a relationship class in ArcGIS). This method doesn't return a value. be in the same directory as this script. that masterFeatureClassName does not include the name of the parent feature dataset. primary key field. Therefore, this list is as long as detailEventTableNames. list is as long as detailEventTableNames. # and the value is the most recent date for a detail record. # field, modify it. We only want delta rows where there's really a change. The `gis.users.create()` method creates users for your Web GIS in ArcGIS Enterprise or ArcGIS Online. The recent update to ArcGIS Online introduced new parameters when creating users not yet implemented for users when created in Enterprise. The API for Python release 1.5.2 `create()` method tried to populate these new parameters when creating users in Enterprise, leading to an error. We logged BUG-000119265 to track the problem. We've caught the problem. We have containment. We've updated the `gis.users.create()` method with the API for Python version 1.5.3, which will be coming soon. The method now properly unpacks the parameters whether the `create()` method is run for Enterprise or ArcGIS Online. We've corrected it and are moving onward. Stay tuned for future releases full of great new functionality! I have been working on a project were I am looping through rows of data and importing them into a geodatabase. While some of the data had coordinates, some didn't, but did have a street address. With that, I needed to quickly geocode a single address while looping through the records. Along with my coworker @TomSellsted we created a python function to do just this. As a disclaimer, it requires the 'requests' library that is in the ArcGIS Pro and 10.6 install. Other new features and bug fixes associated with this release can be viewed here. This includes a MapView.take_screenshot() function, Spatially Enabled DataFrame updates, and more! Integrate this new version of the Python API into your environment, and as always let us know your feedback! The wicked flexible Spatial Dataframe turns up the volume with a new accessor-based implementation that allows for access to spatial operations as a property on the steady, reliable Pandas Dataframe. Just use the sdf property and you're all set. With this new way of working with the Spatial Dataframe comes improved rendering and projection support along with enabling Arcade expressions. And you know that's not all, so head on over to the API for Python Guide Release Notes to scope out the details...and then stay tuned for an awesome new series of blogs coming soon to the ArcGIS Blog that will highlight intense new workflows incorporating these new features! Experience 3D Mapping in Beta v1.5! v1.5.0 of the API is public! Do NOT use this beta, use the public non-beta v1.5.0.The rest of this blog post is no longer relevant: Please see this blog post for more information. If watching today's UC Plenary inspired you to think about "What's Next? ", then try downloading the new bleeding-edge beta v1.5 of the ArcGIS API for Python! This version of the API includes support for 3D Mapping, WebScenes, exporting maps to standalone HTML, and more! PLEASE NOTE THAT THIS IS A BETA RELEASE. It is not as stable as v1.4.2, and should not be used in production anywhere. The API is subject to change before it's official v1.5 release. The best place to get started is to view this example notebook that will walk you through all of the new features of this map widget. You can view the API reference for this new beta release here. Feel free to report an issue for any bugs you find in this beta release, as well as if you want to recommend features or just tell us your thoughts! We really do value your feedback, so drop us a line and let us know what you're thinking! We've released the next version of the ArcGIS API for Python - version 1.4. Click here for instructions on how to upgrade, and view the whole range of release notes. There's a ton to be excited about it in this latest offering, and just in time for the 2018 Esri Developer Summit. Let's highlight some of the new features so you can make the most of what this API has to offer. You wanted the option to install the ArcGIS API for Python with pip, so we've responded and made a pip package available through PyPi, allowing you to install the API according to your needs. See the documentation here for full details on using the pip package manager to install the API, differences between installing with pip and conda, and much more! We've also added options to the connection experience for using your Web GIS. You now have the ability to initialize a GIS object from a token created externally. The token generated from apps or sessions elsewhere will allow you to connect with the API and access Enterprise or Organization resources. Also upon connecting, we've enabled the persistence of profiles so that you can store your credentials locally in a secure manner and log into the GIS using the name of a profile instead of entering credentials. You're even able to store multiple profiles and use them simultaneously. Check out more details in the Guide for Working with different authentication schemes. We're really pleased with improvements we've made to the Spatial DataFrame. Incorporation of the shapely package enhances the interoperability of the ArcGIS API for Python. Working with shapely and other geospatial data science packages like GeoPandas and fiona allows the ArcGIS API for Python to read and write almost any geospatial format on any platform. Improvements to the plotting method of the Spatial DataFrame provide an extensive range of symbology options for visualizing data with the Map widget. We've also added upload management functionality to the Feature Layer Collection object so you have more ways to attach information where it's most useful in your GIS. And with more functions added in the raster functions module, the future is bright for all kinds of analysis, visualization and data management with the ArcGIS API for Python. The Python API in Jupyter notebooks is great for exploratory data analysis. You can quickly visualize data using symbology from matplotlib. Interested in learning and using the Python API? We encourage you to consider making it priority number one. Check out this video recording of the GeoDev Webinar Series to get a broad perspective of what you can do with the API. 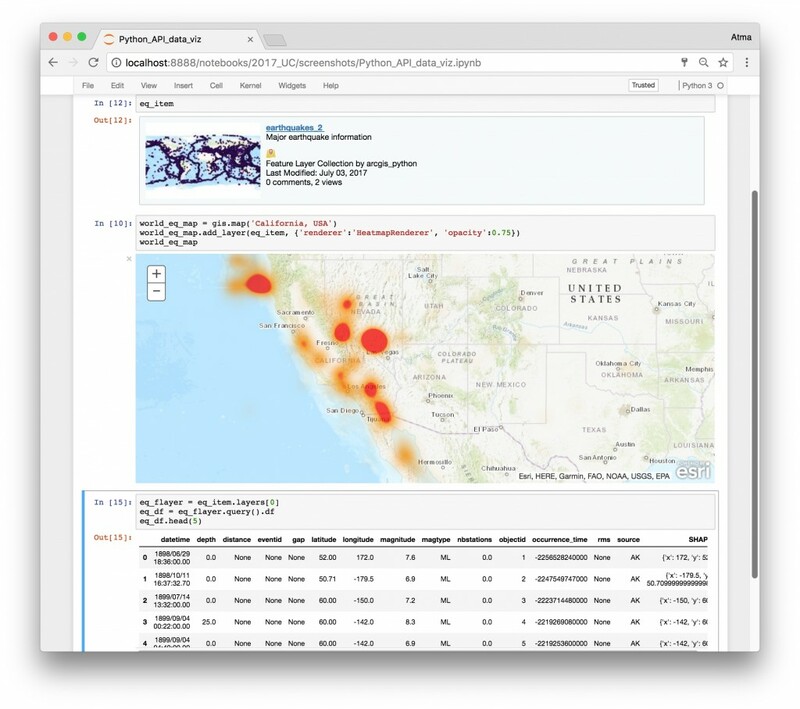 Also, add the ArcGIS for Developers Sample Notebooks and Dev Labs to your to-do list to inspect the capabilities of the ArcGIS API for Python for yourself. Sessions galore for you to explore at The Developer Summit in Palm Springs - We'll see you there! ArcGIS API for Python available through pip! Pip can be configured to be a more lightweight than conda. It is often distributed with operating systems or other software, and can be installed very easily if you already have python on your computer. You can take advantage of this, for example, by installing the ArcGIS API for Python with minimal dependencies. This might be useful if you want a lightweight API to use just for administrating your GIS servers. Pip and conda are totally separate package managers, and should avoid being used interchangeably. The API is still also available for download through conda, and it is recommended that you use conda to install the API if you are a beginner user. Read more about the differences between pip and conda here. Click here to view the official installation guide for pip. We are pleased to announce the newest release of the ArcGIS API for Python (version 1.3) ahead of the holiday season. This version packs some serious enhancements for GIS administration, content management, and performing spatial analysis. Cloning content from one org to another is a popular use case for many users. GIS administrators and publishers can now leverage the built-in ability to clone items using the latest API. At v1.3, you can pass a bunch of Item objects to the clone_items() method and have those items, and their dependent web layers be cloned along with their content and metadata. The API takes care of swapping the URL in the web maps and apps to match the new web layer URLs. Admins can work with and manage their unfederated ArcGIS Servers. The ‘server’ module of the API has been enhanced to support authenticating and working with stand-alone ArcGIS servers. At 1.3, the API has brought to life a feature that many users have been asking for. You can now easily save your map widget into a web map. The map widget in Jupyter notebooks has been enhanced to list the layers you added, remove them interactively and finally save the widget into a web map. This lets you save your outputs and analysis results for use in other ArcGIS applications. In addition, the WebMap class has been enhanced and lets you author and edit web maps. Analysts and publishers can then create web maps when using the API in a headless or script mode. The Python API in Jupyter notebooks is great for exploratory data analysis. You can quickly visualize spatial patterns using smart mapping, as well as the attribute data in a tabular form. When performing an analysis, often you face questions such as, “who are the people that live in this area?”, “how diverse is this neighborhood?”, “what is the average commute times and mode of transportation for residents of this zip code?”. Enriching your GIS data set with socio-economic attributes like these will greatly enhance explaining a prevailing geographical phenomenon or will simply add more context to the conclusions that you are drawing specifically from your analysis work. With the newly added ‘geoenrichment’ module, users of the Python API can call into the ArcGIS GeoEnrichment Service and collect demographic and other thematic information about their study areas. To empower your imagery analysis, many raster functions have been added. In addition to these new capabilities, several enhancements and bug fixes have been included in the 1.3 release. Check out the release notes for more details. With the new year upon us, are you thinking about any resolutions? If learning and using the Python API isn’t one, we encourage you to consider making it one. Check out this video recording from the GeoDev Webinar Series to get a broad perspective of what you can do with the API. Also, add the recent ArcUser article “Harness the Power of GIS with the ArcGIS API for Python” to your holiday reading list. Still not convinced about Jupyter notebooks? Check out this blog post: A Whole New Way to Experience GIS. We are excited to announce the release of version 1.2.4 of the ArcGIS API for Python. This version includes a number of bug fixes and updated documentation. You can find the list of reported bugs addressed in the release notes. If you installed using ArcGIS Pro, you can also update your package by using the 'Update Packages' tab from the 'Python' tab in Pro backstage. ArcGIS API for Python team. We are excited to announce the v1.2.1 of the ArcGIS API for Python which includes a number of bug fixes and updated documentation for a lot of the new features introduced earlier in v1.2. You can find the list of reported bugs addressed in the release notes. This release includes documentation for building a distributed GIS using collaborations, managing your ArcGIS servers using Python API, administering your ArcGIS Org / Enterprise, customizing the appearance of your Org. We are excited to announce the v1.2 of the ArcGIS API for Python to coincide with the Esri User Conference 2017. This is release packs a slew of new features, samples and numerous bug fixes to both the API and the samples. You can find the list of fixes and enhancements in the release notes. The v1.2 version requires Python interpreter 3.5 and later. This means, it would not work with the Python installed with ArcGIS Pro 1.3. We request our Pro users to upgrade to ArcGIS Pro 1.4 or 2.0 and reinstall the latest arcgis package. If you were using v1.0 in Python 3.4 environment, please create a new environment and install either Python 3.5x or 3.6x and then install the arcgis API. We are just a few hours from Esri User Conference 2017! Below are some sessions to attend if you would like to learn more about the ArcGIS API for Python. Stop by the 'Developer Expo area' at Exhibit Hall B-1 to meet the team. We will be available all week to answer your questions, learn about your workflows and requirements. Hope to meet you at the UC!